Christina Rossetti wrote this poem about her brother, the artist and poet Dante Gabriel Rossetti, and his muse, Elizabeth Siddal. For years Siddal was known primarily as the woman who modeled for Rossetti and his fellow painters and was perhaps better known for her morbid postmorten experience than for anything she accomplished in life. Today, Siddal has become a sort of feminist icon, the subject of biographies, her work resurrected by galleries and websites. Elizabeth Eleanor Siddall was born in 1829; she later shortened her last name to "Siddal." A young woman of working-class background, she found employment as an assistant to a milliner. In 1849, a young artist named Walter Deverell happened to walk into the shop and asked her employer if her assistant would model for him. peare, romantic poetry, medieval legends such as King Arthur, and the Bible. 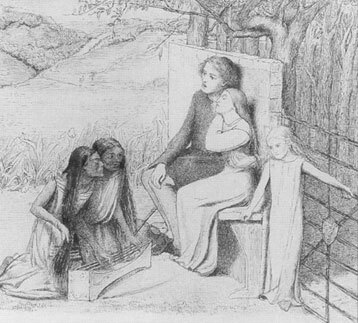 Siddal soon became a popular model for the PRB. She can be seen as Viola in Deverell's Twelfth Night, Sylvia in Hunt's Valentine Rescuing Sylvia from Proteus, and most most famously, Ophelia by Millais, where she posed for hours in bath water that had turned icy. She developed a serious cold afterward and apparently never completely recovered. Curiously, Siddal was not considered beautiful by the standards of her day. The male artsts of the PRB painted an idealized version of her visage; she painted herself far more realistically. Life seemed to take a propitious turn for Siddal. She and Rossetti became lovers, living together in Chatham Place. 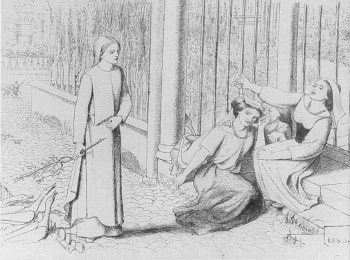 He drew her incessantly; she appears in his works Ecce Ancilla Domini, The Wedding of Prince George and Princess Sabra, How They Met Themselves, The Tune of the Seven Towers and Dantis Amor. Both he and John Ruskin, the influential poet, author, artist and art and social critic, encouraged her to paint and exhibit her works and write her own poetry. 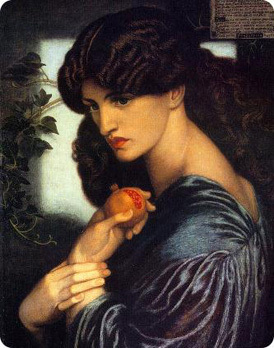 As the years passed, however, Siddal and Rossetti became less congenial toward each other. 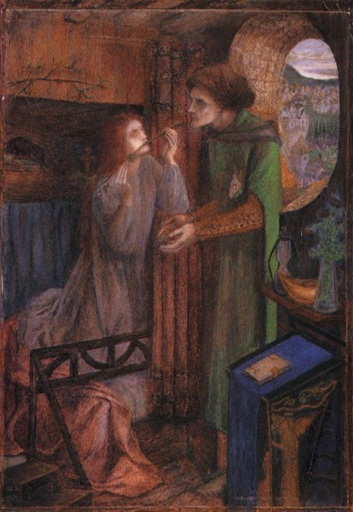 Rossetti was reluctant to propose marriage, supposedly in part because of Siddal's working class background. 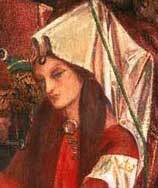 Siddal was also suffering from increasingingly poor health. She could apparently be needy, demanding, and somewhat irritating. 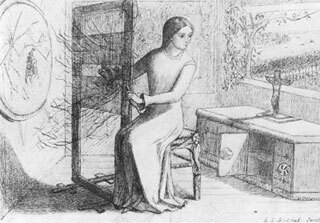 "In an Artist's Studio" notwithstanding, Christina Rossetti disliked Siddal for the most part. 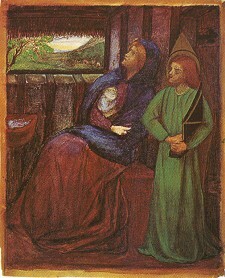 Siddal's situation became more bleak with the passing years. As she approached 30, she was facing life as an unmarried, not quite respectable woman, and was now addicted to laudanum, a liquid form of opium used to dull physical pain and emotional distress. Meanwhile, Rossetti was having affairs with other models and had fallen in love with the PRB's latest "stunner," Jane Burden. 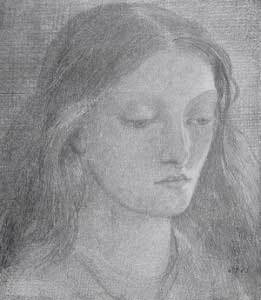 However, in 1860 Rossetti did marry Siddal, in all likelihood out of sympathy for her plight rather than for love. 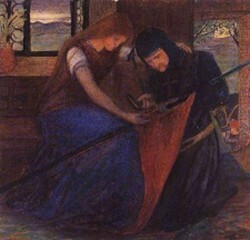 Jane, who most likely returned Rossetti's affections, married his friend, the artist, writer and craftsman William Morris. 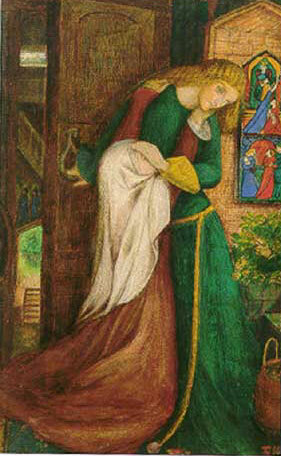 Siddal reached her emotional abyss after giving birth to a stillborn daughter in 1861. 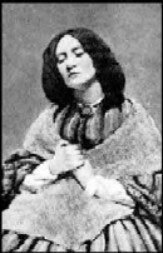 Several months later Rossetti returned home one night to find her dead, either by an accidental overdose of laudanum or suicide. She was 32 years old. 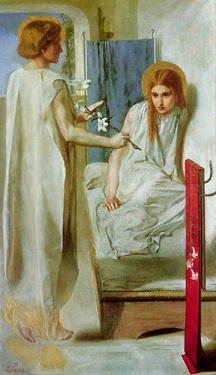 Rossetti blamed himself for Siddal's death. In his grief, he plunged a manuscript of poetry he was working on into her coffin. He then painted the Beata Beatrix as a memorial to her. By 1869, Rossetti had gone from a Romantic idealist to a balding, middle-aged man having an illicit affair with Jane Morris, the wife of his friend and colleague, his career a shadow of what it had been. His thoughts turned to the buried manuscript of poetry, and at the encouragement of various colleagues, he finally ordered the exhumation of Siddals coffin in order to retrieve it. 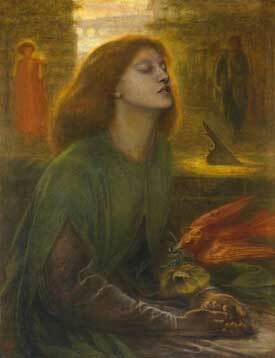 Rossetti was not present when her coffin was exhumed in the dead of night. Rumor has it that she was perfectly preserved, her hair as red as ever; waist-long when she had died, it had continued growing till it nearly filled the coffin. Rossetti, however, writes about finding worm holes in the manuscript. The poems were published but did not do well commercially or critically, and Rossetti never got over the fact that hed had Siddal exhumed. Now addicted to laudanum himself, he attempted suicide by taking an overdose in 1872 but survived. He died twenty years later, a wasted version of his former self. 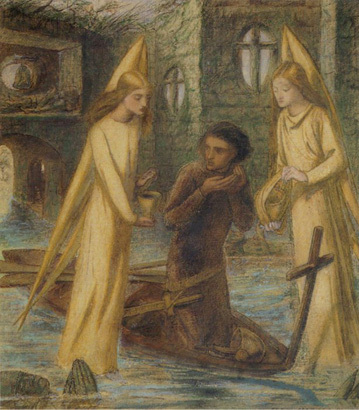 Siddal's poetry is that of one suffering from melancholia, if not out and out clinical depression. Yet it more than effectively captures her angst, despair and alienation, as well as her anger and pride. Her art, while a bit short on technique, has an eerie, other-worldly quality. While she is not considered to be in the same league as the men of the PRB, one has to wonder what she could have achieved had she lived in a time when women could forge an identity beyond the traditional female role accorded to them by society and had the opportunity to study and be considered as artists in their own right, not just enchanting faces staring out of canvases. To feminists she represents a woman twice wronged, in life and in death, a woman forced to live in the shadow of her male peers, a girl who gives her love but sees that love returned only to her idealized self: "Not as she is, but as she fills his dream." Once she becomes a real person and her beauty fades, she is emotionally abandoned by her lover who chooses to seek out newer, younger, and possibly less demanding cohorts. 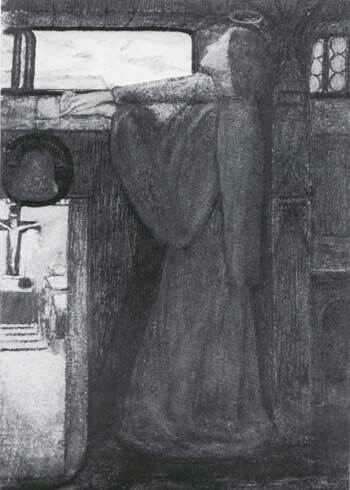 Or perhaps Siddal is not so much the victim but a woman who could not save herself from her own inner demons. At any rate, one cannot help but sympathize with someone whose life, once so full of promise, went so wrong. I sit in thy shadow  but not alone. Christ her grief to tell. Her lovers soul shall bring. And sing at His right hand. Lord may I come to thee? Lord, lift me from lifes stony way! My live into a dream of love! The passion from my blood? And lighted all my ways. My spirit was so light. Naught but rest seems good to me. Lest I may wake, and weep.